Home » Technology » LATEST SMARTPHONE CONSISTS OF T11 AND P11 QUAD-CORE JELLY BEAN INTRODUCED BY PANASONIC. 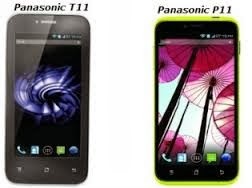 Panasonic Ltd. unveils two types of new Android devices called T11 and P11 quad-core Jelly Bean. The phone is obtainable in online through e-commerce sites for Rs.9,520 and Rs. 16,364. 1. T11 Panasonic consists of 10K device. It is designed with a 4-inch IPS display and has 1.2 GHz quad-core processor powered with 1 GB of RAM. 2. The memory capacity contains 4GB of built-in storage which expands its support upto 32 GB of microSD card. 3. The connectivity consists of 3G support, dual-sim, WiFi, and bluetooth. 4. It has 5 megapixel rear camera and also a VGA front facing camera for video calling. 1. The Panasonic P11 smartphone has a 5-inch IPS display with contains software with Android 4.1 Jelly Bean. 2. It has 1.2 GHz quad-core processor with 1 GB RAM. 3. It also estimates same as T11 smartphone memory capacity. 4. Rear camera contains 8 megapixel camera and 2 megapixel front camera for video calling. These two smartphones try to win with the device like Samsung Galaxy Grand Quattro, Lava Iris 504Q, Xolo Play, Q1000, Micromax Canvas 4 A210, Karbonn S5 Titanium etc..